This season is going to be a success. Designers have already thought about the perfect look for this autumn. Combination of bright colors, classic patterns and stylish accessories will create a stunning look of a young girl. The using of natural fabrics will make the feeling more comfortable. Each look requires having an appropriate accessory that will match the whole appearance; how about this classical hat by Borsalino? It is made from Merino wool of high quality. The item is of a deep blue color with a grosgrain blue ribbon that comes around the brim. This accessory with goes nicely with a nice dress or a suit; elegancy and originality will be achieved if putting on this stunning hat. Silk dress like this one by Fendi is adored by young ladies. The magenta pink dress has over all paint splattered print of blur color. The dress has front button fastening and a frilled hem. 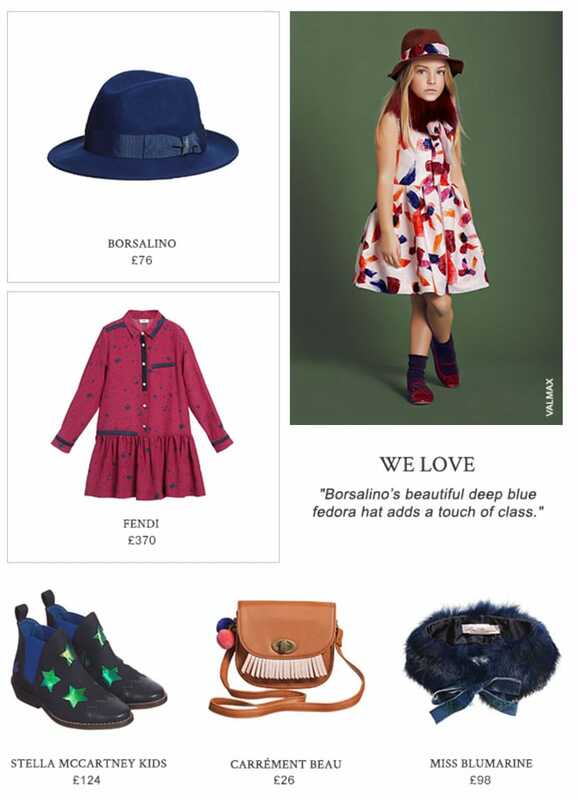 Stella McCartney Kids impresses all young children and their parents this season. Look at these unique shoes with shimmering green starts on it. They have convenient elasticated sides that will help the girl to put them on faster. Hard sole is followed by a small heel; for more impressive look, put the shoes on with a bright dress. Every stylish girl would like to have a small bag to carry all necessary staff; Carrement Beau knows how to satisfy the demands of young princess. This brown shoulder bag is an ideal accessory for a casual style. Two blue and pink pompoms and pink fringing make the item more girlish. Choose this navy blue fur collar by Miss Blumarine to match the festive look of your girl. The collar is embroidered with a velour bow in the front. A formal white shirt will come perfectly with such a luxurious fur cape. Each of the above-mentioned clothes can be easily purchased via the Internet at any convenient time.